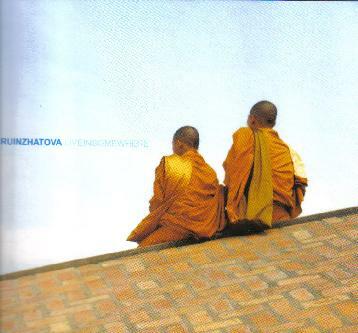 Ruinzhatova - "Live In Somewhere"
I have to admit when I first got this CD I had no idea what to expect. By my first glance at the cover, I thought to myself it was maybe some strange group of Monks showcasing a bunch of annoying chanting. Glad to see that I was wrong. Actually, this Ruinzhatova CD is better than I expected. Turns out to be some out-there Japanese experimental / Avant Garde. The line-up features musicians from other bands like: Yamamoto Seiichi (Boredoms) - synthesizer and percussion, Tatsuya Yoshida (Ruins,Acid Mothers Temple) - piano,drums and vocals and Tsuyama Atsushi (Akaten, Acid Mothers Temple) - guitar, bass and vocals. Total of six tracks to thoroughly soak in here. "Everywhere" is a good eleven-minute trippy number, and "Somewhere" along with "Elsewhere" are rather wild and jazzy. Another eleven minute track, "Nowhere", sounds to me like it's been tastefully improvised. "Where?" is highly experimental, perhaps too much for some. And the final tune, "Here", is extremely jam-oriented. Probably the best cut on the entire CD. This is one of those discs that definitely grows on you after the second and third play. It might possibly appeal to fans of Fushitsusha, High Rise, Green Milk From The Planet Orange and Uli Trepte. Definitely an acquired taste. For more information you can visit the Vivo web site at: www.vivo.pl.